Here at Open Culture, we happily acknowledge that learning is not a one-size-fits-all proposition. The internet may be doing a number on our attention spans, but as the world has grown smaller, the educational buffet has grown richer, more varied, and vastly more affordable. Take for example the History of the World. Geography fans can approach the subject via Ollie Bye's year-by-year animated map. John Green’s playful Crash Course series offers a wonderful respite for any kid grinding their way through AP World History. Those of a more traditional mindset, who prefer a statelier pace can lose themselves in 46 lectures by Richard Bulliet, professor of history at Columbia University. 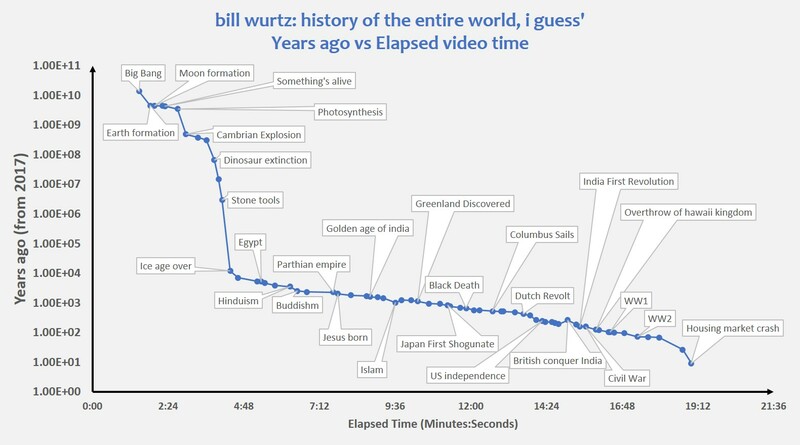 And then there’s world history according Bill Wurtz, above, a creator of short, anachronistic-looking videos, whose YouTube fame was kindled by Vine, a now defunct app for sharing short-form videos. Chafing at Vine’s 7-second time constraints, Wurtz undertook a more ambitious project, a condensed History of Japan that would employ the same techniques he brought to bear in his shorter works: graphic text, clip art, and Microsoft Paint drawings. He zeroed in on the subject because he knew precious little about Japan, and looked forward to doing some virgin research. Wurtz followed up the 9-minute History of Japan, above, with History of the Entire World, I guess. You may bridle at first, but stick it out. Its charms sneak up on you. Time is not particularly relative in Wurtz’s compressed universe. Whether it’s 10 minutes passing before some major development or 500 million years, their passage is accorded equal heft. This is the rare history video where science plays a major role. It takes time out for weather updates—the floor is no longer lava, the entire world is now an ocean… it’s sobering to remember that ozone is what made it safe for multi-celled life forms to venture forth on land. Empires rise and fall, unconquerable rulers are unseated and forgotten. Of course the problem with a great overview such as this is the back end’s shelf life can prove rather short. It’s been a little over a year and a half since Wurtz posted the video, and thus far, his parting shots still feel pretty relevant: armed drones, 3d printing, plastic-choked oceans, and a seemingly unbridgeable gap between the desire to save the world and an actual plan for doing so. 1.18.19 12:53 am are you ever going to make anything else as in depth as history of japan or the world? Unsurprisingly, he’s the subject of a lively sub-reddit. One fan, reddit user n44m, was inspired to plot the timeline of History of the Entire World, I Guess, below. To learn more about some of the civilizations, events and persons featured in History of the Entire World, I Guess, check out another fan’s annotated transcription here.